Grilling isn’t only about building a fire and cooking the food. There are a few things that you need to know about equipment before you head outside. The first decision you need to make is what kind of grill to use. Both grills produce great food, so choosing is basically a lifestyle choice—although some of us who are grill obsessed avoid making a choice, and use both! If the grill fits…cook on it! So, you’ve decided to buy a new grill or perhaps your first grill. You should approach this purchase just like buying any other major appliance. First, determine your needs and your budget. Then do the research. You want to make sure that you get the maximum grill for the money. How much will you use the grill? Are you are an every-night griller, weekly, monthly or a special occasion griller? For more frequent use, look for grills with heavy-duty enameled, stainless-steel or cast-iron cooking surfaces and a larger cooking surface. How many burners are there? If you are going to cook foods by indirect heat (and once you start grilling, you will definitely want to!) you need to make sure that your grill can be set for indirect heat. This means you need a minimum of two burners that go around the circumference of the cooking box. Three or more burners are even better. If in doubt, call the manufacturer before purchasing your grill. How sturdy is the grill? Will it roll or topple over in a strong wind? What if the neighbor’s dog comes sniffing? Feel free to kick the tires a bit before purchasing. Remember, if you buy the right grill, it will serve you well for years and you won’t have to replace it every year. If you are looking at gas grills, make sure the propane tank is a safe distance from the igniter and burners. What is the warranty? How long is the grill covered? When does the manufacturer recommend replacing the grill? What parts are covered, not covered? You should expect that any parts that a manufacturer doesn’t cover will need to be replaced. A well-made grill should last years, even decades before it needs to be replaced. Does the grill come with accessories that you will use? A side burner looks great on the showroom floor, but if you don’t already have a need for it, chances are you’ll end up wishing you had an extra work surface instead of a side burner. 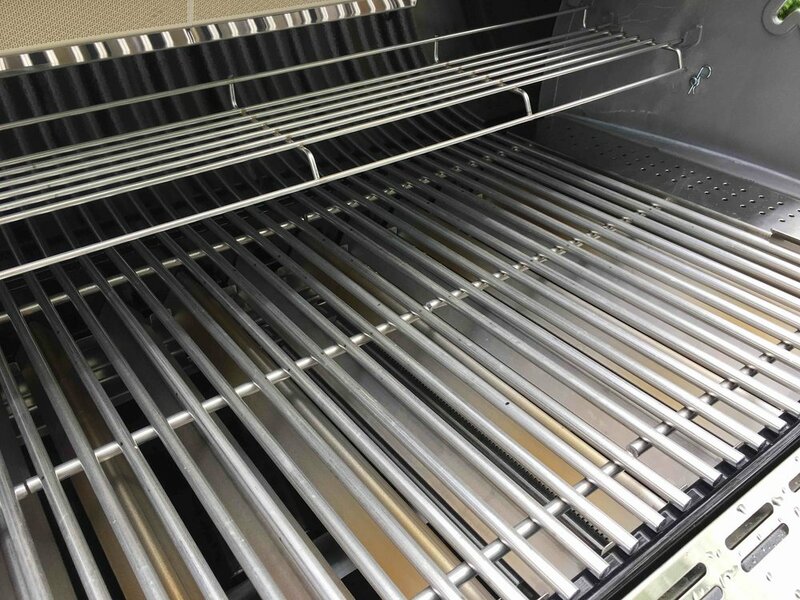 Also beware of too many shelves on a gas grill, some shelves can not be removed and thus all the food has to be under 4" thick, meaning no grilled turkey, whole chicken, squash, roasts and other large foods. A glass window will blacken very quickly with use and runs the risk of breaking. If the accessory looks nifty, ask yourself the simple question: will I use it or is it just a gimmick? How large a grill do you need? For almost everyone, a standard size grill (3 or 4 burners) will suffice. But make sure that you don’t use this as your excuse to buy a grill that won’t go the distance. Remember, the better grill you buy, the more you will use your grill and the louder the applause you’ll get for your grilled meals! The grill always looks bigger in the store before you fill it with food to cook. 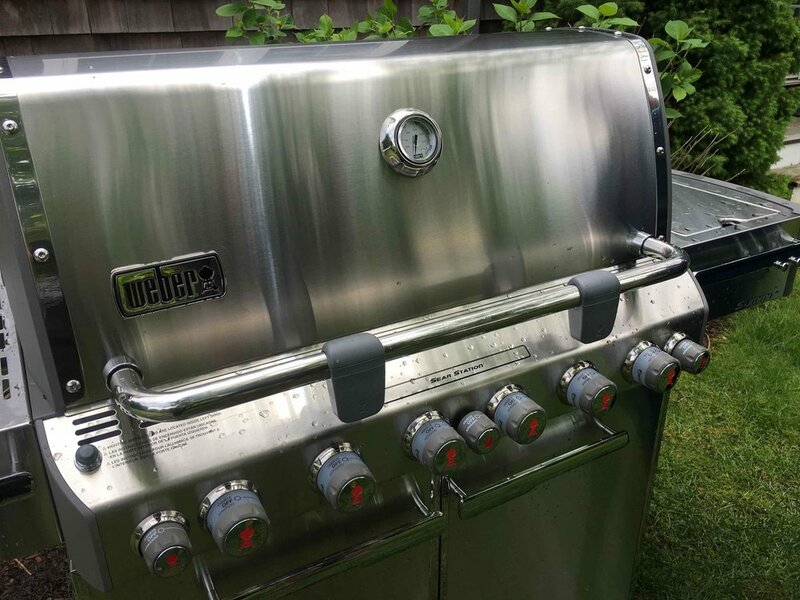 Now that you’ve thought about your grill needs, if you are like most of Americans today, you’re leaning towards the easy to light, easy to clean, gas grill. If you and/or your family still need convincing, read on. My informal poll of women tells me that 9 out of 10 of us grilling gals prefer gas to charcoal.